Ductless fume hoods by Air Science® protect your personnel and the environment from toxic or volatile chemicals so that you can concentrate on what matters most: your work. 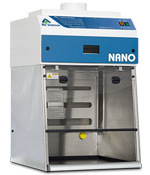 Continuous airflow across the work surface draws contamination away from the user, recycling clean air back into your laboratory. Our ductless fume hoods provide energy savings, safety and convenience and are available in a variety of configurations, including mobile fume hoods and polypropylene fume hoods. The Purair ECO Series high efficiency ductless fume hoods protect the user and the environment from hazardous vapors generated on the work surface. Advanced carbon filtration technology offers a safe, high performance alternative to conventional ducted fume cupboards for a broad range of applications. Environmental Benefits. Our ductless fume cupboards isolate and trap chemical vapors to prevent ecological impact through release into the environment. Versatile. Each filtration system is selected for its specific application. The Multiplex Filter broadens the range of applications. Carbon filters are available in more than 14 configurations for use with vapors or organic solvents, acids, mercury and formaldehyde. HEPA/ULPA filters can add to biological safety. Easy to Install. Ductless fume cupboards are self-contained and do not require venting to the outside. Many units are portable and may be moved from one location to the next with minimal downtime and without filter changes. Set-up, operation and filter maintenance are straightforward. Safe to Use. 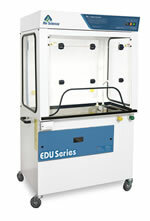 Cabinet airflow and face velocity protect users from incidental exposures to fumes. Self testing. (selected models) Electronic airflow monitoring assures continuous safety. An electronic gas sensor monitors carbon filter performance.